The Pet Gear Expedition No Zip Pet Stroller is ideal for when you want to get your pet out and about. This large stroller offers a spacious, comfortable ride for both single and multiple pets. It features two easy-locking doors. 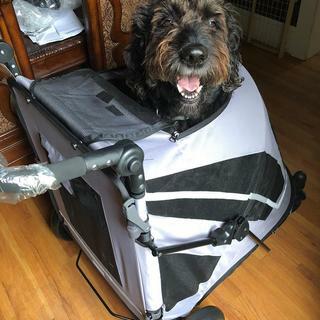 Pets can now be loaded from either the front or back of the stroller and exit without having to turn around, a huge benefit for large or injured pets. No zippers mean no hassle when trying to open and close the stroller. The No zip means that you can easily gain access to your pet without fumbling with the difficult zippers. A multi position handle and parent tray and cup holder have been added to provide more comfort to you while pushing the stroller. Two interior safety tethers and aback wheel brakes add to the safety. 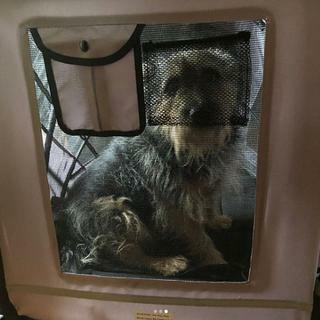 A zippered top mesh window and viewing area allow for your pet to have ventilation as well as see out into the world. A removable interior liner allows for easy cleaning. The easy fold mechanism and easy assembly make it a snap to set up and put away. 600 Denier Nylon makes it durable. It’s really a great stroller. Took me about 4 minutes to assemble it out of the box you don’t even need to use instructions it’s that simple. Very easy to maneuver and to fold up for putting in my truck. Granted it doesn’t quite fit my dog but sort of knew that when I bought it - that it was going to be a VERY tight fit. We have a 95 lb English Creme Golden Retriever so he cannot ride in it with the top down, I just keep it up. But he loves it. And I love the water bottle holders and little storage compartment for his poop bags and a tennis ball! It’s suoer easy for Kota to get in and out of it. I have to sort of manipulate his position when he gets on and lays down just to make sure he’s on the “flatbed” (that’s what we call it now because it’s more like a flatbed than a stroller the way we use it). I’ve thought about cutting out the mesh in front so he could use it with the top down - I’d need to cut the mesh out of front so his legs could dangle out. This is one of the most economical strollers out there and it really is worth every penny. I also got it on sale for Black Friday through Stateline. I wish I could post a picture but there doesn’t seem to be any where on this review site to upload. Bummer!! I purchased this large stroller for my 20 lb. Poodle mix, so that she would have plenty of moving/laying room when I go on long walks and for vacations. Although perfectly suited for a larger doggy, it is just perfect for my baby and she absolutely loves it! So much larger than her small stroller and the no-zip has been a dream. No more fighting with zippers or worrying if a zip her tail/fur into the zipper. Super easy entry from the front canopy or full size rear door. Very easy to put together in minutes and well built and sturdy. So far, it rolls like a limo and comfortable to push. We get a lot of attention while out and about. I would definitely recommend for all sizes but especially small, older/disabled doggies like mine. My dog loves this. She is elderly and walks for awhile but feels so proud being pushed in the cart. We had the older model of this cart for our handicapped dog, which was so helpful until the wheel finally broke off. Didn't want to pay top dollar for this model, but gave in and are so glad we did. Roo (short for Roosevelt) climbed right in and we took him on long stroll. The cart is lighter weight, but also sturdier, and the steering is so smooth, it's like operating a high-class car. I own the smaller size of this stroller. Regrettably, my puppy out grew it in about three months. This stroller is much larger than I had anticipated; when comparing it to the previous purchase which was a size down. She now fits comfortably within and has more than enough space. (She is a tall, 67lbs, 10 month old pittie). 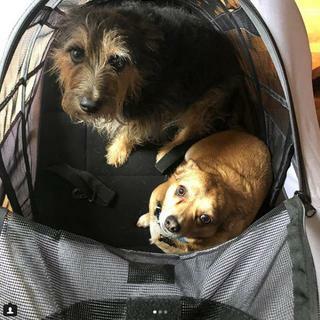 I use this stroller on the MTA to travel to and from doggie training classes/courses and or play-dates with her brother in the city. The stroller is sturdy, not heavy when comparing it to the size. The back door access is wonderful, she loves that she can stick her head out of the top. I am hoping that once she gets older, she will appreciate and will lay calmly with the doom pulled back. Overall, well worth the investment. Fits my 2 medium dogs fine, my 110 lb Labradoodle, not so much. I purchased this for Milo, my cairn terrier b/c he has arthritis in his hind legs and for Milton, my chiweenie, to accompany him at times b/c his pudgy body gets tired on walks (haa) so I wanted it to be able to fit them both. I also wanted to make sure it was big enough to fit Max, my labradoodle. Though Max can get in it, with a bit of maneuvering, he can only sit upright like this with his head poking out which is kind of a bummer b/c I wanted to make sure it fit him if he ever needed to use it. I love the pet stroller. It is good looking well built and easy to push. It allows me to get my disabled Corgi out for some fresh air and a change of scenery. Wonderful product. My 10 year old lab mix has injured hind leg and I am using this product as part of his recovery process. i choose this product due to size and $$ . Will that stroller carry my 110 pounds lab? BEST ANSWER: Weight-wise, yes....length, probably not. My 110-115lb labradoodle fits in it only sitting up with his head poking out the top. It took a minute for me to get him in it really b/c the inside is a tight fit. 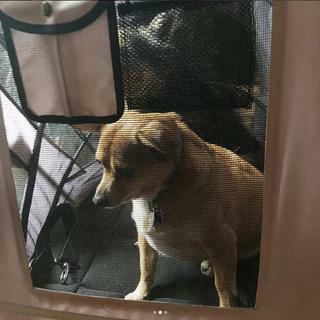 you have to open the whole thing, open the back door, have your dog lay down, put the top back down, tuck his tail in, have him sit back up and then close the door to the back. I enclosed a review w/ pix recently to show that. The weight limit is 150 pounds. Are the wheels made of plastic? BEST ANSWER: They feel like more of a tough plastic/ hard foam composite. It feels like a rubber tire but is solid instead of filled with air. 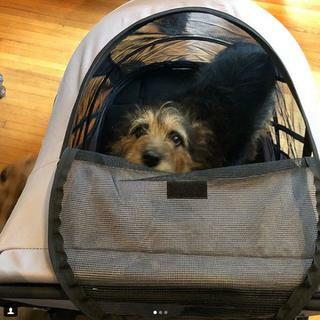 I had an older Pet Gear stroller, but it had a lot of design flaws, I ordered this model because I saw that they were all resolved, and I'm glad I did. No complaints, the only issue I've ever had is that it's wide, so in some of the small shops I went in on vacation it was difficult to move around. But I needed it to be wider, so it's only a flaw if you're looking for something narrow and streamlined. Yes, and the posts are also plastic and quite fragile. The front wheel broke when we first got it, but to their credit, the company sent us a new one. Cushioning is good, just be careful going over curbs. Is this stroller large enough for my 70 pound lab to lay down in? BEST ANSWER: We have a 50+lb pit bull who typically sits but when he does lie fully down it's a perfect size. If you're dog is happy to sit for the ride he enjoys the sunroof. It's a pretty smooth ride and it feels pretty sturdy so I would think it would support the weight but in terms of length lying down, it might be a little snug. Our dog is 60lbs and he's a bit squooshed inside, but he likes it. His back end pushes against the back. We cut the lower mesh in front so we can roll it up, and that way he can have his head out a bit. BEST ANSWER: The weight limit is 150lbs. BEST ANSWER: Item is available in fog which is a light tan or boysenberry which is a raspberry.